Faster Pussycat, "Don't Change That Song"
I was extremely disappointed to read Archphoenix's post yesterday where she couldn't believe that Ratt was still together. Where the hell has she been? Dismayed, I had no other choice but to buy her lawn tix to Rock N America, a three-day rock festival of awesomeness with the following lineup: Scorpions, Twisted Sister, Ratt, Dokken, Warrant, Great White, Lita Ford, Slaughter, Sebastian Bach, L.A. Guns (unfortunately, it's the Tracii Guns version), Firehouse, Bullet Boys, Lynch Mob, Pretty Boy Floyd, Steelheart, Faster Pussycat, Enuff Z' Nuff, Toxin, with more bands to be announced! How can you stand so much rock? This ain't ironic hipster posturing, either. I would love to drive out to Oklahoma and see this show. Hell, I still have cassette tapes from most of the performers. And the one that hits the tape deck first? 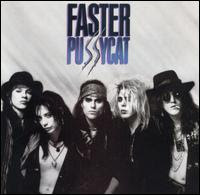 Faster Pussycat's self-titled debut. From 1986, here's Faster Pussycat's "Don't Change That Song."